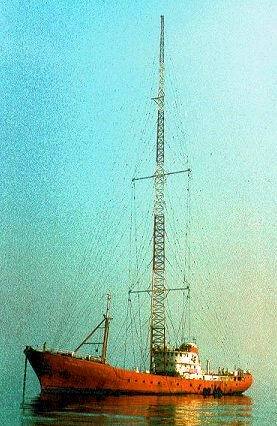 Radio Caroline celebrates its 50th birthday today, 28th March 2014. For many, the very founding of the station in 1964 is a major cause for celebration. But I would argue that it is in the station’s long history of survival and independence that the real cause for celebration lies. Today many people will be celebrating the birth of Radio Caroline in 1964, and it’s founding as the first pirate station off the UK coast by Irishman Ronan O’Rahilly, and rightly so. 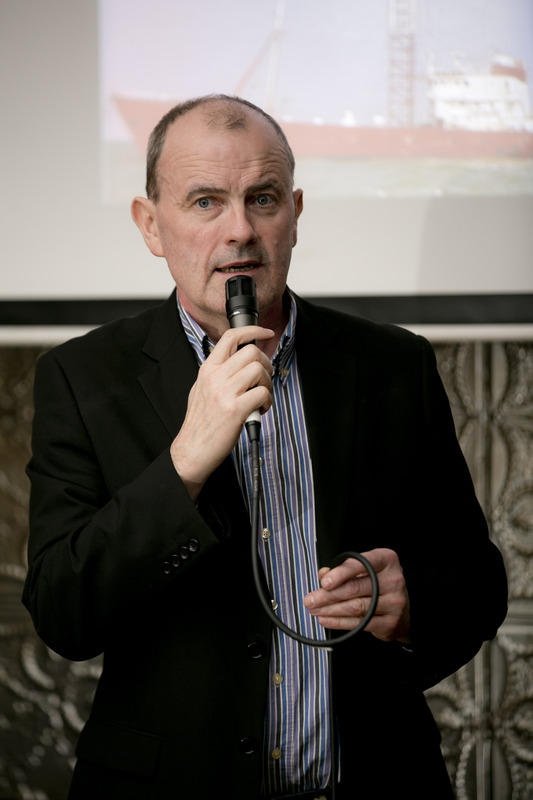 Ronan broke the mold, challenged the dominance of established players in both the recording and radio business, and certainly made sure that legal commercial radio on land in the UK was (reluctantly) introduced by the British government probably a decade before they would otherwise have done so. In the founding of an offshore pirate, Ronan was not unique however. Another station – Atlanta – was being launched at the same time, and was beaten on air by Caroline by just a matter of weeks, and many others followed, including giants such as Radio London (1960s) Radio Northsea (1970s) and Laser 558 (1980s). No, where Ronan really stood head and shoulders over all others in the field was in his unique ability to make his station last. To stay on the air, to fight for, and retain independence. Radio London, and all the other 60s offshore pirates off the UK coast closed down when the 1967 Marine Offences Act became law, criminalising the supply of offshore broadcasting ships, and the buying of advertising airtime on them. But where others left the stage, Ronan fought on, and Caroline continued. 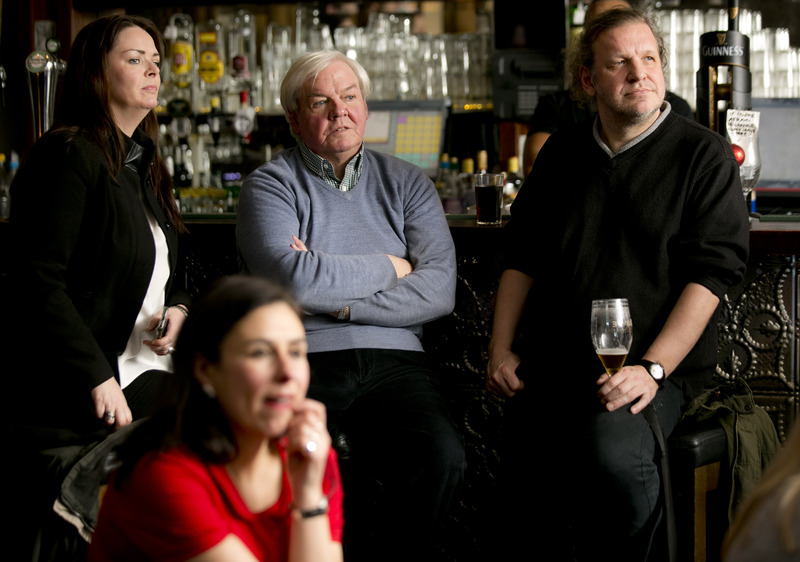 Ronan’s defiance of the Act encouraged others, but none of the offshore stations aimed at the UK in the 70s and 80s managed to last more than a few years. The biggest, and most successful, Laser 558, was only on air for 18 months (and a followup Laser Hot Hits had an even shorter duration). It was Ronan who stayed the course, and kept Radio Caroline at sea and on air, despite every setback the government or the weather could throw at him. His ability to ressurect the station when it got into scrapes was legendary. But did Caroline really matter? 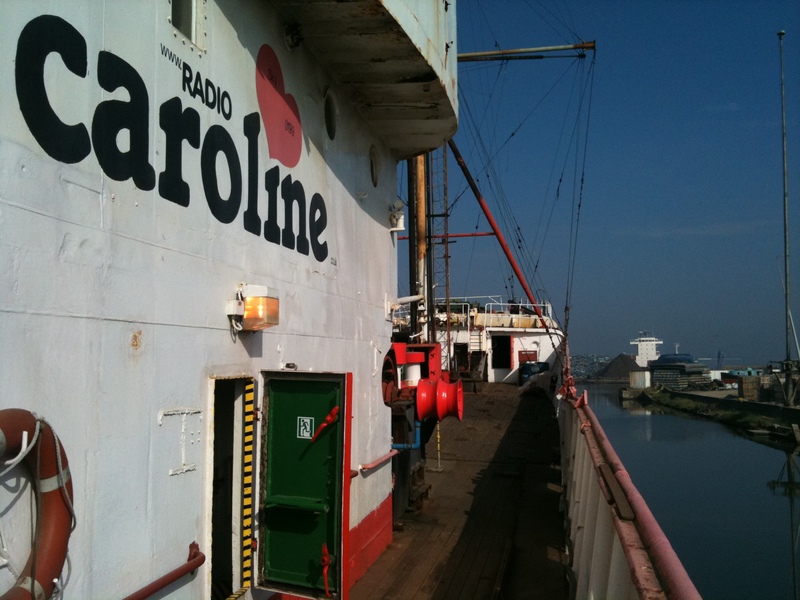 Once commercial radio had come to the UK, was there a point in Radio Caroline continuing? I would argue that there was, and very much so. Commercial radio, when it came to the UK, was long over-regulated and tightly bound by needletime and other restrictions which prevented it from funjctioning as true music radio. And stations were often owned by powerful and well-connected people, in effect becoming just as much of an insiders club as the BBC had been in the 60s. Where could you get your music played if you were a new band? Where could you hear album tracks rather than just singles? Not, by and large, on mainstream commercial radio (though there were some honourable exceptions to this). Caroline continued to stay outside the system, and outside the jurisdiction, right through to the end of the 1980s. And this mattered, not only to the listeners who got enjoyment from it, and the hundreds of staff who passed through it’s doors (well – ok, hatchways) but also to the governments. Radio Caroline was outside government control, and if there is one thing governments really, really don’t like, it is something outside their control. Especially when that something involves free speech, and the ability to be heard by the masses. The fact that Caroline never said anything seditious, and just quietly got on with sharing great music with its listeners was not the point. There were people out there, on a ship, with a transmitter, capable of being heard, and immune from both government control, and it’s lapdog, big business influence. This had to be stopped. 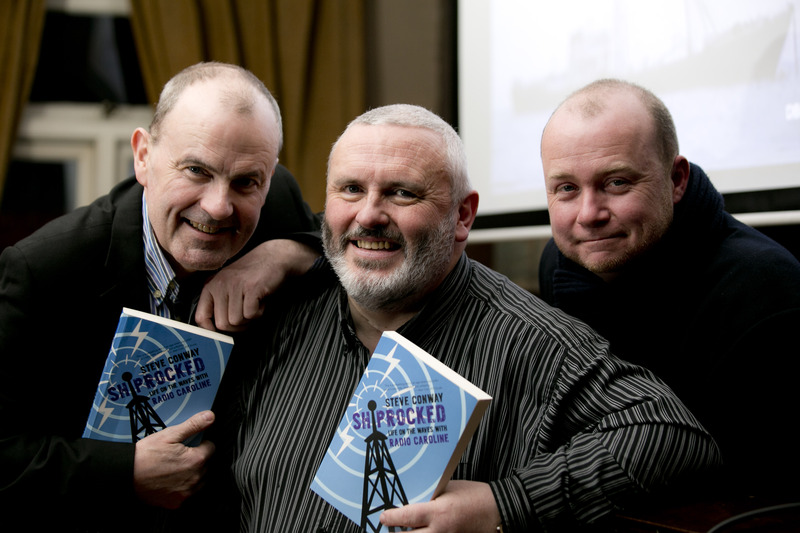 Did governments really worry that much about Radio Caroline? Oh yes they did . . Witness the ratification of UNCLOS (United Nations Convention of Laws Of the Sea) by 157 countries around the world, a treaty that ranks offshore broadcasting alongside real piracy (seizure/hijacking/hostage-taking) as well as the slave trade (human trafficking) in terms of a menace that uniquely allows a country to board a foreign registered vessel in international waters. 1. All States shall cooperate in the suppression of unauthorized broadcasting from the high seas. 2. For the purposes of this Convention, “unauthorized broadcasting” means the transmission of sound radio or television broadcasts from a ship or installation on the high seas intended for reception by the general public contrary to international regulations, but excluding the transmission of distress calls. (e) any State where authorized radio communication is suffering interference. 4. On the high seas, a State having jurisdiction in accordance with paragraph 3 may, in conformity with article 110, arrest any person or ship engaged in unauthorized broadcasting and seize the broadcasting apparatus. (e) though flying a foreign flag or refusing to show its flag, the ship is, in reality, of the same nationality as the warship. 2. In the cases provided for in paragraph 1, the warship may proceed to verify the ship’s right to fly its flag. To this end, it may send a boat under the command of an officer to the suspected ship. If suspicion remains after the documents have been checked, it may proceed to a further examination on board the ship, which must be carried out with all possible consideration. 3. If the suspicions prove to be unfounded, and provided that the ship boarded has not committed any act justifying them, it shall be compensated for any loss or damage that may have been sustained. 4. These provisions apply mutatis mutandis to military aircraft. 5. These provisions also apply to any other duly authorized ships or aircraft clearly marked and identifiable as being on government service. The ranking of stations such as Radio Caroline alongside the slave trade and ships hijacked by real pirates illustrates just how seriously governments regard the ability of individuals to have access to broadcasting – radio or TV. Think of this: Forget terrorism or drug trafficking (neither of which are grounds for search and seizure of ships in this convention). The one thing that 157 different government agree is the really, really dangerous menace of the high seas, the force that causes most harm to society, is to have a bunch of hippies on a ship sharing their love of the latest Nick Cave album. In some countries, this fear takes the form of keeping most media state owned. The UK and Ireland, as more liberal democracies, don’t do this any more, though in point of fact they had to be dragged kicking and screaming into the era of commercial radio by the offshore pirates in the case of the UK, and landbased ones in Ireland. But the instinct to control runs deep, and where hard power cannot be used, soft power is always an alternative. If you can’t restrict access to broadcasting to directly state-owned operations, you can at least operate your licencing system in such a way that those who have control of most of the licences are known, and safe, and establishment. And safeness breeds sameness and lack of diversity, which is one of the reasons why it is so very important to have alternatives who are outside the cosy circles of the industry, even if to be such an outsider feels, at times, like being a lone voice crying in the wilderness. Since Radio Caroline came ashore in 1991, there have been many, many opportunities to sell out, and let the brand or the station take investment from big groups or big business. All of these, while seemingly friendly and from corporations who doubtless would have promised to respect the station’sethos, would certainly have led to the destruction of Caroline in pretty short order – sanitised, corporatised and probably eventually discarded too. This has happened to so many great independent radio stations, so many idealistic groups of individuals. That Caroline stayed away from this temptation is a minor miracle, and here all credit is due to Ronan O’Rahilly and in latter years Peter Moore for refusing to take the easy option and sell out. Caroline has ploughed a lonely furrow over the years, surviving on the margins, but it has stayed independent, and for that, we can truly give thanks, and wish the station a very Happy 50th Birthday. Radio Caroline is still alive and can be heard today via the new frontier of independent, uncontrolled speech – online. Tune in at www.radiocaroline.co.uk or download the smartphone app. 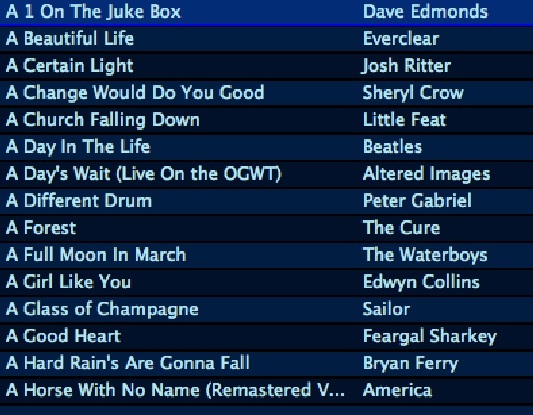 Here is the tracklisting for episode 5 of An A-Z of Great Tracks, broadcast January 29th on 8Radio.com and due for repeat on Saturday 1st February 2014 from 10-11am. Week 5 of the show, and I continue to rediscover gems, great and small, that I had all but forgotten. This week’s surprise for me in my own library was “Adult Education” from Hall & Oates, a track much played on Caroline back in the mid-80s, but which I would swear I have never heard on the radio since. I’ve never been able to quite decide if the lyrics of this little piece represent wordplay of the best kind, or simple frat boy humour: “teachers don’t know how to deal with the student body” but either way, this is a slice of pure 80s, a throwback to a more innocent age, and a gem at that. JJ Cale “After Midnight” another little piece of audio bliss for me too. Next week, we come to a word that takes us into rich musical territory. Here is the playlist for the third episode of An A-Z of Great Tracks. It’s my aim each week as we go through this marathon, to post not only the playlist for the show itself, but also my thoughts on the music involved, the production process, or anything else that comes to mind as I am on-air. And this week, although we are still very much at the beginning of the letter A musically, we will be thinking much of the letter J . . Episode 3 aired on Jan 15th 2014 on 8Radio.com, in its regular weekly slot – 8-9pm Wednesday evenings – and as from this episode we have a repeat slot on the following Saturday morning 10-11. So this week I want to share some thoughts on the presenting aspect of the show, as the pleasure that I get from doing that in a fairly flexible environment managed to turn what had been a pretty ratty day for me yesterday into a very enjoyable evening. The great Caroline presenter Bob Lawrence once told me that there is nowhere on earth more fun and exciting than being behind the mic on a live radio show, and as I walked into the 8Radio.com building last night and the day’s cares melted away, I smiled and thought about just how right he is. Presenting live can be about so much more than simply playing a set sequence of tracks, if the station you work for allows you to exercise your “J” skills. The “J” in this case is the “jockey” part of “disc jockey“, a term that has tended to fall out of use in the radio world in favour of “presenter“, and not wholly for the obvious reason of “presenter” sounding more upmarket. There is a subtle difference between the meaning of the words that actually underlies a lot that has changed in radio. But let’s start with the music from the track listing above. A good diversity this week, of styles (from indie and classic rock through to pop) eras (classic Cohen through to recent albums from Bell X1 and Editors) and feels (upbeat and punchy, softly emotional, sparkly near disco). Some weeks I have to work hard at my selection of A-Z tracks to achieve balance, and others just fall into place naturally, and this was one such week. The quirk this week was the double appearance of Procul Harum, this sort of thing will happen from time to time, but works out nicely in this case as we get to hear a lesser know (but wonderful) track first, with the more obvious one rounding off the show. My “should I or shouldn’t I?” track this week was the Duran Duran one – I thought about it, slept on it, asked a couple of friends, and then went with my gut instinct of “In”. But if you look at the track listing above, simply as a listing of music to be played one item after another, there is still a little something missing. If you were to play these, juke-box style, on your mp3 player, you’d probably enjoy a lot of the tracks, but the switches in style and mood might be jarring. This is where the presenting – or I should say “jocking” – comes in. Disc Jockeys were originally named because they would, in an aural sense, “ride” the discs they were playing, melding them together by beat or interspersing them with chat in such a way that no discernible gap was left in the “set”, and such that a collection of individual tracks were transformed into a whole. The style in which this was done would vary by context – in a disco or club building energy, keeping momentum on the dancefloor and seamless mixing of tracks are very important, whereas on radio there is a need to integrate a much wider mix of styles and speeds of track, and the necessity to give lots of information which in a club would distract or ruin the buzz. There are really two styles of presenter on radio – ones whose show is predominantly personality driven (think Chris Evens or Chris Moyles) and those in whose programmes the music is the star, and they are the enabler of this music for the listener. (for the record, I would be in this second group). Radio station idents (or jingles as they used to be called) can be wonderful tools when used in the right way – the right one, at the right point, can build energy, act as a full stop after a cold ending song, block or transition between moods, and, just occasionally, help to keep the station identified, if you haven’t spoken for quite a while. But mainstream radio, more and more, has fallen into an utter fear of the listener not knowing which station they are listening to, to the point that on most stations it is mandatory for the presenter to play an ident after every single track, unless there is a spoken link (and sometimes as well as the spoken link). This over-use serves another purpose, it helps disguise the fact that tracks are not longer (for the most part) put together to complement each other, but just random pairings from computerised rotations, and so something is needed to separate each one. The sad thing is that even tracks which would go wonderfully into each other end up being divorced by idents. And radio, far from being the friend of old, starts to sound like an insecure partner, constantly clamoring for you to notice them. One of the most difficult transitions I ever made was when I was working for a former pirate station which then went legal, and later still got taken over by a big conglomerate. The free playlist of the pirate days gave way to something more structured in the legal era, but that was fine. the DJ still had control, could switch the running order of tracks as long as all were played, and could choose when to speak, what to say, and when and where to put idents. But gradually, as time moved on, it became more and more locked down. Idents became mandatory between every track. Running order no longer to be changed. And, eventually, when taken over, the playlist eventually included defined points where you were allowed to speak, with instructions for the topic “promote new music” “promote next show” etc, and even duration “short link”. And the problem with these is that they were computer generated according to a predetermined format, and totally out of context with what was around them. So when you were playing a new track from a band who might be in for interview later on another show, you couldn’t promote it there, because you had no spoken link scheduled at that point. Where you might have spoken to break or build mood after songs A and B and before C, you now had to play A, B and C together, with idents, and then speak before D, despite the fact that if played together, C and D would actually have been wonderful partners. Now, I have no problem with a music format. I’ve run tightly formatted music stations myself. 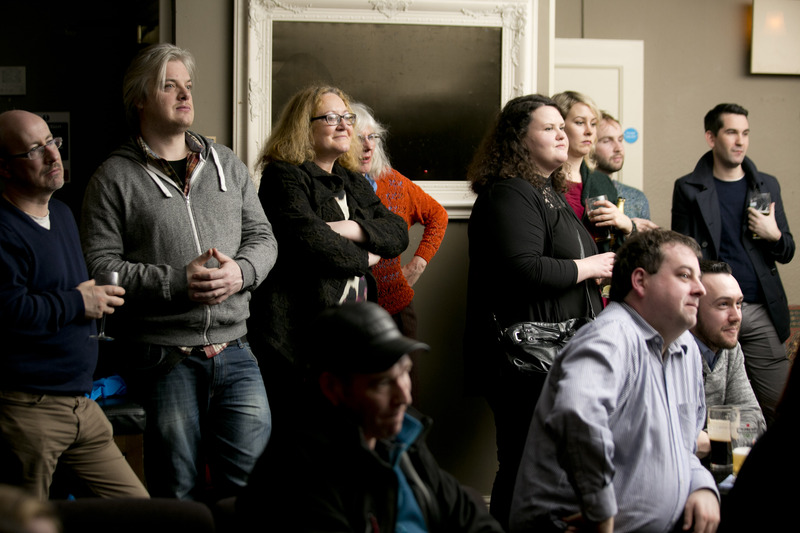 Likewise, I’ve no problem with general guidelines for presenters – there should be a “house style” or whatever based on the audience you are addressing and the ethos of the station. But if you don’t marry that with a little bit of creative freedom for the on-air staff to “ride” the show, move stuff around, use thier best judgement to create natural breaks and changes – you are really only tapping a fraction of their talent, and only getting half of the product that you could actually be serving up to the listener. OK, so I’m not saying that I’m some great DJ here. I’ve always regarded myself as merely “competent” and a “safe pair of hands” and have no illusions of being a superstar. I could never reach, nor aspire to, the heights of great personality presenters like Evans of Moyles, or top notch music presenters like Peel or Harris. But I’ve been around a long time, and worked with a lot of smart people (Hello Bob!) and more importantly, I’ve listened to a lot of radio, and learned what pleases me. And so I like to think that, if not a superstar, I am at least reasonably good at turning a bare bones playlist, such as the above, into something closer to a seamless whole. And again, thanks to the enlightend leadership of Simon Maher at 8radio.com, I am allowed a free hand to structure the show as I choose. No restrictions on what I say and when I ID – he trusts to my common sense. Given that I’m presenting an A-Z, the running order is less flexible in terms of music, though as I’m choosing only around one in six of the tracks from my library, I do have some scope to keep things balanced, and look for pairs of tracks that work together. But I probably have to work harder to make the show flow than I would if I could just drag and drop any track anywhere. So, I start off the the list of tracks I’m intending to play (as from the image above) and first look at how they go together, and where I might want to speak. And then sprinkle in a small number of idents, not placed everywhere as on mainstream radio, but specifically at certain points according to what I am trying to achieve. And I choose each specific ident (rather than just playing any ident) for each slot, again according to what I’m trying to do. I walk into the studio with my playlist ready, and a plan of what’s going to be done, but that plan is subject to change – and is always changed – while on-air. 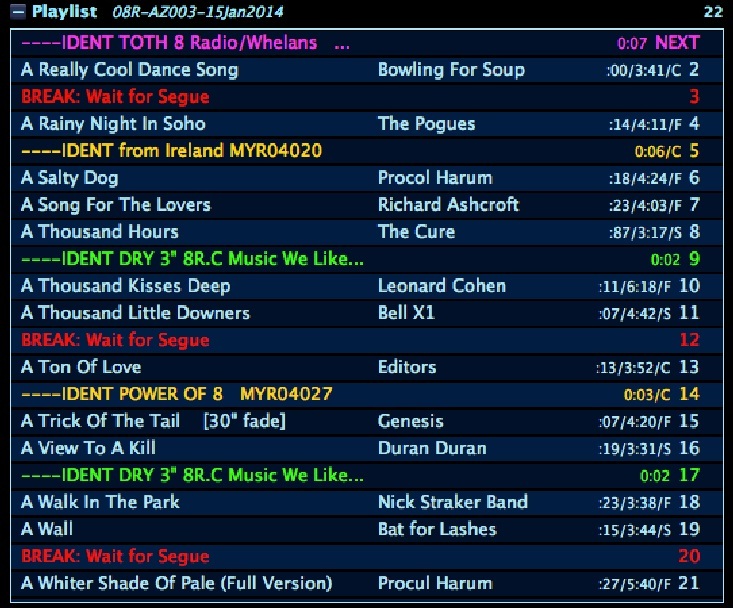 So above is the end result, this is what my playout system shows after I finished the show last night. (I have my own music library and playout system which I use for this show) This is pretty close to what I went in with, but with a couple of minor changes (I put a break (music stops) between Bell X1 and Editors as I had more to say than could fit in the intro, and I dropped an ident over the start of Nick Straker Band literally 5 seconds before the track was about to begin. It just felt right. You can see that, apart from the standard Top Of The Hour ID for our sponsors, I’ve only used 4 station idents in the whole hour. Ah, the joy of being able to let two pieces of music play into each other without having to have an intrusion between them! The red “BREAK” sections are where I am talking dry, between tracks, with nothing playing. At other points I talk over intros (at The Cure, Duran Duran, and Bat for Lashes). For my own convenience, I’ve colour-coded my idents. Yellow idents have music or effects and play on their own to separate tracks from each other, while green ones are “dry” and play over the intro of the next track. The Procul Harum “A Salty Dog” track and the Richard Ashcroft “A Song For The Lovers” work beautifully together, and segue nicely, to break them apart with either an ident or a spoken link would have been a travesty. Those two could also have led into The Cure track, but I wanted to speak here because I was delineating it, and the two that followed into a group of three which all featured “A Thousand” – one of the fun parts of the A-Z being the way that tracks will group themselves together thematically in this way. Speaking after the end of the “Three Thousand Tracks” (!) breaks us up from Editors, which is very different, but the Genesis track that follows that is much slower, and so a yellow ident is needed to keep them apart. And so on. Duran Duran is more poppy than the other tracks in the show, but luckily the slightly disco-esque Nick Straker track is there to pair with it. I hadn’t planned on putting a dry ident over Nick, but when it got to 5 seconds counting down, it just felt overwhelmingly right. That’s the fun of live radio when you are allowed to have control over what you do. You press play at the start of the show, and suddenly you are at the wheel of a mighty juggernaut roaring down the freeway at top speed, you can’t stop, you can’t get off, you have to keep control of it, and make all the little adjustments neccessary to keep it moving forwards in the centre of the lane . .
It’s really addictive stuff, and no matter how you are feeling when you arrive at the station, once that red light goes on, nothing else matters. By contrast, a live radio show where every little detail is pre-scripted, immutable, and not really designed to flow feels like flying a plane . . on autopilot. I can’t stress highly enough how many really good people there are out there in radio, the majority of them way better than I can ever hope to be, but who are sitting, with their hands tied, behind a microphone, and being told to “sound excited”. Isn’t it better to be excited? It’s time we put the J back into DJ don’t you think? The A-Z of Great Tracks, a trawl through the music I have played and collected over my nearly 30 years on radio, will be deeper and broader than a simple quick flick through greatest hits, and includes album tracks and unreleased material from artists as diverse in style and time as Leadbelly and Greenday, as well as unreleased or unsigned music I’ve played on the radio in the past. Neither is it a simple alphabetical regurgitation of everything in my library – I’m selecting on average about one in six of the tracks I possess, based on how good I feel they are, their musical and emotional impact, notability, and their contribution to the overall feel of each episode and the series as a whole. 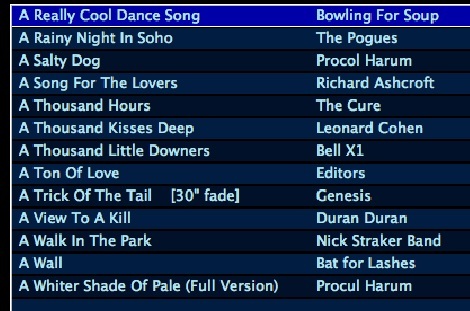 Above is the tracklist for the first episode, which broadcast on 1st January 2014 – it represents, in my mind, a nice mix of styles, decades, and levels of recognition. The A-Z of Great Tracks is on 8Radio.com every Wednesday evening from 8-9pm. I will usually be presenting live in studio, with occasional pre-records when I have conflicting commitments. And speaking of commitments, this is a big one. So far I have selected all the “A” tracks due to be played, and it will take 16 hours (thus 16 weeks) to get through the first letter of the alphabet alone. 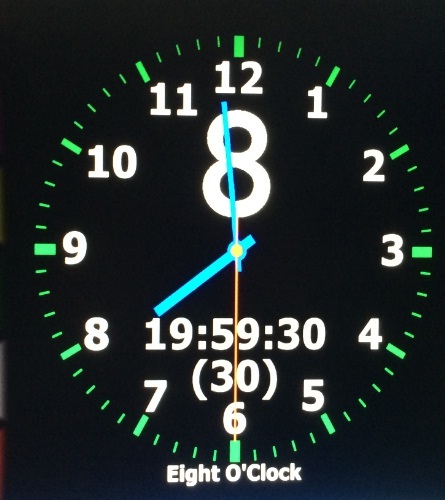 My rough estimate for the series duration is 5 years – and a lot can happen in that time! New artists / albums are featured as well as old, so the size of the library I am selecting from will continue to grow as the months pass by. Join me next Wednesday for episode 2. 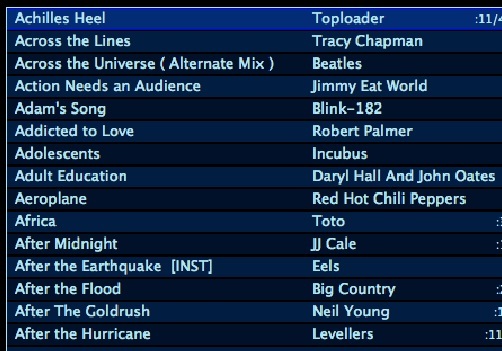 I’ve been pretty quiet on here recently due to pressure of outside work commitments, but I’m still keeping up my regular schedule of radio presenting on both 8Radio.com in Dublin, and Radio Caroline internationally. I’m also still a regular reader at the Last Wednesday writers open-mic in Dublin, 7pm at The Twisted Pepper in Abbey Street on the last Wednesday of every month, where you can hear me read new short stories as well as extracts from my forthcoming book Running Away From The Circus – Eeverything I Know About Radio I Learned By Screwing It Up. I’m insanely busy due to other commitments at the moment, but hope to get back to a more regular update schedule here soon! 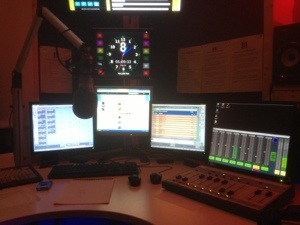 I’m currently on-air at 8Radio.com till 2am. That lovely heady vibe of a late night radio studio, lights down low, music up loud. There really is nothing like it!